An archive of Websites, e-mails, photos, video, audio, and discussion groups. Proving Osama bin Laden wrong is the right thing to do. And when we remember that victory is certain, we can stop scaring ourselves to death. 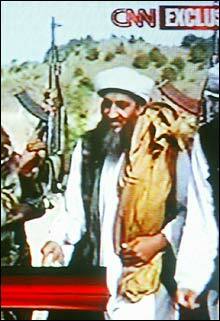 Osama bin Laden in a pre-September 11 videotape that was televised last month. n several of his demented sermons, in the days before he achieved global notoriety, Osama bin Laden made his followers a sort of promise. Defeating the Red Army in Afghanistan and bringing down the Soviet Union, he said, had been the hard part. The easy part - the destruction of the United States of America - was still to come. That task would be easy because America was corrupt and cowardly and rotten. It would not fight (as the debacle in Somalia had shown); it was a slave of the Jewish conspiracy; it cared only for comfort and materialism. I had felt this way once before, on Valentine's Day 1989, when the Ayatollah Khomeini offered a bounty in his own name for the murder of a fiction writer then living in Western Europe. On that occasion, the response had not been so unanimous. 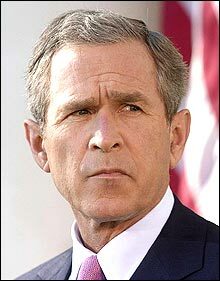 The first President George Bush, when asked for a comment on the Khomeini fatwah against Salman Rushdie, had replied that as far as he could see, no American interests were involved. In September 2001, there wasn't much evasive babble of that kind. It had become plain to any thinking person that Islamic absolutism was a deadly and immediate menace. Look at what it had done to its own societies: the Stone Age misery imposed upon Afghanistan or the traumas visited by fundamentalist gangs on Algeria or the state-enforced stultification in Saudi Arabia. If they would treat their "own" people like that, what might they have in store for us? There's no time to waste on the stupid argument that such a deadly movement represents a sort of "cry for help" or is a thwarted expression of poverty and powerlessness. Osama bin Laden and his fellow dogmatists say openly that they want to restore the lost caliphate; in other words, the Muslim empire once centered at Constantinople. They are not anti-imperialists so much as nostalgists for imperialism. The gang that kidnapped and murdered Wall Street Journal reporter Daniel Pearl - and proudly made a video showing the ritual slaughter of a Jew - issued a list of demands on that same obscene video. One of those demands was for the resumption of US sales of advanced F-16 fighter jets to Pakistan. Only a complete moral idiot can believe for an instant that we are fighting against the wretched of the earth. We are fighting, as I said before, against the scum of the earth. t is important to realize at the outset that a victory for those forces, of which bin Ladenism is only the most extreme, is in two senses of the word impossible. Impossible, obviously, from a moral point of view and from the viewpoint of survival. It has taken us a long time to evolve a society that, however imperfectly, respects political pluralism and religious diversity and the emancipation of the sexual life. A society that attempts to employ the objective standards of scientific inquiry and that has brought us the Hubble telescope and the unraveling of the chain of DNA. Clearly, there can be no compromise between this and the ravings of those who study dreams and are deluded by wild prophecies and who regard women as chattel and unbelievers as sacrificial animals. For them, the achievements of science are nothing, while the theft of weapons of mass destruction counts as a holy task. Their degradation is bottomless. This also entails the second sense in which their triumph is impossible. Even if it wished to go there, the Muslim world cannot be returned to the desert and to the precepts of the seventh century. Every such attempt has been a terrifying failure, just as every jihad has ended either in ignominious defeat or in fratricide among its partisans. 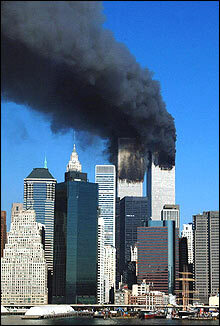 In a broadcast just after September 11, bin Laden deputy Suleiman Abu Gheith warned Muslims living in the West not to reside in tall buildings or fly on airplanes, because the rain of death was not going to stop. There are many, many Muslims, and not just in the West, who do not care to be spoken to in that tone of voice. But more to the point, why are we so timorous in the face of such a contemptible foe? Why did our vice president go into hiding? Why are we so bent on the useless collective punishment of law-abiding air travelers, none of whom are any better protected from a determined suicide-murderer than they were this time last year? What is the point of all these ominous "warnings" issued by the authorities, which resemble airport or subway announcements in being very loud but highly incomprehensible? Where is the spirit of Flight 93? Of the gamut of emotions that made the scoreboard a year ago, many people reported a sense of powerlessness or helplessness. This is defeat in the mind. It is certainly true that the national security elite underestimated Al Qaeda before September 11, to an extent that verges upon criminal negligence. But that would be the worst justification for overestimating it now. And people do not make the best decisions when they are afraid. It was a mistake to pass any law in the immediate aftermath of the assault. Congress should have insisted on a full accounting of the failures of the executive branch before submitting to that same branch's panicky demand for measures that infringe on the letter as well as the spirit of our Constitution. Imagine the grin on the faces of the enemy when they read that Canadians can no longer, with mere student visas, cross the border to take classes at US colleges. That should settle the terrorists' hash. No: When we remember that victory is certain we can at the same time stop scaring ourselves to death. y most enduring memory of last fall, apart from the hauntingly beautiful weather that seemed to mock the prevailing anxiety, was of the maturity displayed by American society. Thousands of citizens are burned alive in an instant - some of them consumed by flames on camera - and there is no panic, no lynching, no looting to speak of. A few sick morons take out their ire on random Tibetans or Sikhs: The general disapproval is felt at once. And for almost a month - a month - not a shot is fired in response, and there is no public demand for any theatrical or precipitate reprisal. Then, in a very well-calibrated international action, Afghanistan's Taliban regime is taken down and the Al Qaeda network is dispersed. Let the boasters of jihad remember this and be always reminded of it: Mullah Omar and his gang left "their" capital city of Kabul at dead of night and did not even bid farewell to the people they had so long exploited and tortured. Their guest bin Laden may or may not have met his end under the rubble in some obscure cave, as now seems likeliest. But whether or not he did, his last known action was to run away. As with every big-mouth cleric who ululates to an imaginary heaven about the bliss of suicide-murder, he preferred (and nominated) others to do the dying. In contrast to this cowardly hysteria, innumerable American civilians and soldiers acted with calm and humanity and courage. I was in Pakistan, in Islamabad and Peshawar, and also in Kashmir during the war, and I am as scrupulous, I hope, about civilian casualties as the next person. I was highly impressed by the evolution of military strategy and tactics since the bombs-away inglorious days of the Vietnam era. Many of the points made by the antiwar movement have been consciously assimilated by the Pentagon and its lawyers and advisers. Precision weaponry is good in itself, but its ability to discriminate is improving and will continue to improve. Cluster bombs are perhaps not good in themselves, but when they are dropped on identifiable concentrations of Taliban troops, they do have a heartening effect. If you remember, there were also those who warned hysterically of a humanitarian disaster as a result of the bombing: a "silent genocide," as one Boston-area academic termed it. But to the contrary, the people of Afghanistan did not have to endure a winter with only the food and medicine that the primeval Taliban would have furnished them. They survived, and now the population has grown by almost 1.2 million, as refugees from the old, atrocious tyranny make their way home. Here is the first country in history to be bombed out of the Stone Age. It's not over yet, as we must indeed keep telling ourselves, but thus far it is one of the most creditable military operations in history. And it was achieved with a minute fraction of the forces and resources that are at our disposal. There is not a government in the world that will ever again volunteer to play host to Al Qaeda or its surrogates and imitators. o, as civilians in this war, and therefore as primary front-line targets, we do not need to submit to any culture of trust or loyalty or deference. We have a right to know who is in charge and what policies are being debated and what measures taken. We do not have to agree with the choice of any old ally in this struggle, and we dare not assume that any step taken in the name of the "national security" mantra is automatically OK.
Let me give some illustrations of what I mean: First, I'll take the international front. The most annoying thing, in arguing with peaceniks last fall, was confronting their refusal to see that a wholly new situation had arisen. They would insist on translating the fresh, challenging information back into the familiar language they already knew, of Vietnam or Nicaragua or the West Bank. Well, the same was true of the president's "axis of evil" speech, which attempted to fit the new reality into the reassuring old list of "rogue states" or official enemies. In particular, it seemed insane to include Iran in the "most-wanted" category. The Iranian people, with no interference from outside, have in the past few years developed their own civil-society riposte to the archaic and bankrupt rule of the mullahs. With its dress and its music and its thirst for contact with the outside world, a generation has begun to repudiate theocracy and to insist that election results be respected. A free press is exploding from under the carapace, and electronic communications are eroding superstition. Iranian forces were extremely helpful in combating the Taliban, which had among other things been butchering their Shi'a co-religionists (as have bin Laden's allies in Pakistan). There should by now have been a chorus from the American Congress and press and civil society demanding that the administration make good relations with Iran into a high priority. (By the way, the Iranians detest Saddam Hussein as well, and for excellent reasons.) Instead, we lump together potential friends with lethal enemies, and our elite cringes before Saudi Arabia, which would belong in any "axis." And why should our elite, which has got everything wrong in Iran from the shah to Oliver North's hostage-trading, be trusted just because this is an emergency? The most one can say here is that the "axis" rhetoric has been quietly dropped, but that's not good enough. In case I should be accused of avoiding the question of Palestine, I should simply say that George W. Bush was right in making it plain to the Palestinians that suicide bombing, at this time or any other, would be suicidal only for them. But that does not dissolve America's longstanding promise to sponsor mutual recognition between equal populations - a promise that has been unkept for far too long and is now made more urgent rather than less. Then I started to get angry. I'd already read about Washington's postal workers being felled by anthrax, while life-saving Cipro prescriptions were being distributed on Capitol Hill. And I've since read of the lucky few who are to receive immunization against smallpox. To repeat: The whole point of this war is that it pits us against those who deal in death without discrimination. Even so, we try to fight back in a discriminating manner. But why on earth discriminate among ourselves? If there was ever a time when the demand for comprehensive national health care should and could have been raised . . . Need I complete the sentence? There is a tiny half-truth lurking in the gloating remarks made by some Europeans and others, to the effect that now "Americans will know what it's like." Fair enough. The lazy version of the pursuit of happiness was indeed interrupted by September 11, as other equally lazy versions have been ruptured since. But war, which was once cynically and cleverly defined as "the health of the state," need not be a one-way street. Previous conflicts, in the 1860s and 1940s, also deepened the attachment to democracy, law, and human rights. Within its own borders, the United States is already a potential microcosm of a secular, multinational democracy. We are the ones who have to decide whether such a system can long endure, at home or abroad. Rather than become nerve endings for nameless fear, we can each resolve to become more internationalist and to take a more forward role as citizens. Last September is commonly said to have "changed everything," but it hasn't done so yet. As it does, we will move closer to a cause, and a country, that is already well worth fighting for. Christopher Hitchens is a columnist for Vanity Fair and The Nation and a professor of liberal studies at the New School in New York. His latest book, Why Orwell Matters, will be published in October by Perseus.